In today’s agriculture we use pesticides in order to achieve higher yields or excellent playing conditions on the golf course. Some people may not even think about the consequences or even know what we are applying. I believe that these behaviors have led to a severe decrease to the bee population. The use of neonicotiniods is affecting bee colonies everywhere. These chemicals disrupt the bees’ sense of direction so they ultimately get lost and die. They also may stress the bees, making them more susceptible to varroa mites, which can harm the bees and also serve as a vector for many serious diseases that are fatal to bees. Bees are responsible for pollinating two-thirds of our food crops and contribute to $117 Billion dollars to the economy. The continuing decline of the bees can only have negative effects. Using pesticides to increase yields may actually lead to the decline of yields if this insect dies off. Without their pollinating efforts what can we turn to next? But if we stop using pesticides, what will happen to our yield then? With an increasing population, an increasing demand for food, and a declining bee population, how are we going to sustain ourselves? Bananas face a new stumbling block in their history that could threaten their existence as we know it. The past tells us that we have already lost the majority of our beloved banana breed, the Gros Michel, to a disease. Eventually the Cavendish variety took over and now accounts for 45% of all banana sales. 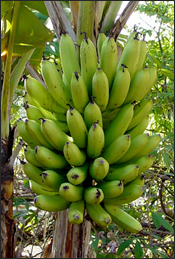 But the Cavendish banana is susceptible to a plant disease,the TR4 strain of Panama disease. Though the plague was originally discovered in 1989, no solution has been found to keep the infection from spreading. The fungus likes to spend its time in the soil and the banana bearing countries are taking preventative measures thwart off any further of the crop’s population. Not only are they in danger of being taken out by Panama disease (TR4) but they also have other factors like other diseases and insect infestations, help to make the issue of banana production at even higher risk (CNBC). After spending considerable time in research and presentations on giant ragweed (Ambrosia trifida), I’ve only scratched the surface to the problem this weed presents to farmers (conventional and organic alike). A prolific weed that not only halts half million dollar equipment during harvest, but has been a golden goose for pharmaceutical companies in the allergy medication market (giant ragweed is the leading cause of allergies in the U.S.). Giant ragweed is one of the more hardy weed species common in Midwest farms. The seed is proficient at overwintering and the plant itself is an aggressive competitor for sun, water, and nutrients. 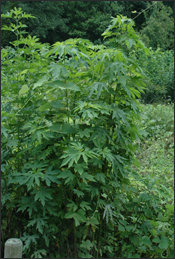 Stands of giant ragweed can reach an excess of 10ft in height if left untreated. Organic farmers who face perennial bouts with giant ragweed understand this problem and often times, are left at its mercy. Non-chemical weed management practices tend to be far less effective at giant ragweed control. As time passes, conventional farmers must now look at other chemical options to increase the effectiveness of their management program. The plant has been exposed to herbicides such as glyphosate and ALS (acetolactate synthase) inhibitor herbicides and the once small number of herbicide-resistant populations now flourish. As giant ragweed continues to evolve, our ability and willingness to adapt must follow suit. Research abounds from many of the U.S.’s top agricultural institutions with efforts to educate not only farmers but the general public about the proliferation of tolerant giant ragweed, and give farmers new management options to improve the performance of their crops. Most of us see plants as defenseless organisms, simply growing on this planet to enjoy the sunshine and provide us with quality air, food, and other products. These seemingly quiet things are on a mission however. Plants aim to reproduce and populate the earth much like humans, and many plant species have developed their own ways to ensure they will live on. 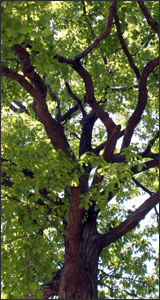 Facing a plethora of predators, plants rely on several different combinations of chemical and physical defense mechanisms to protect themselves against animals, insects, and pathogens. Some notable defenses include growing a dense covering of hair, emitting heart attack inducing toxins, and even attracting predators of predators. That’s right, when being eaten some plants will release a chemical that attracts wasps. Wasps will inject their eggs into the plant predator, killing the pest and bringing birth to a new generation of wasps. It is amazing what some plants are capable of, even the ones right outside our own doors. The next time you see something growing in the woods or in a field, keep in mind that it may not be as harmless as it looks!